The Louis Vuitton Paris City Guide 2011 came out today. And it is full of sweet surprises. The video preview (below) goes into Paris' long term and ongoing relationship with pastries. It highlights explicit details of such mini cakes that have made a name for themselves amongst the Parisians: specifically le saint-honere. 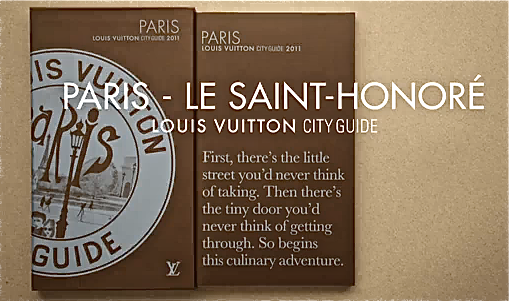 It's a charming video that leaves one's mouth watering pour un gateau and daydreaming of Paris. Bon App! EXPERIENCE OUR NEW & SLEEK NG IPAD APP! DOWNLOAD THE NG IPHONE APP FREE! A DRAGONFLY IN NEW YORK CITY'S SKYLINE? Download The NewsGallery iPhone/iPod Touch App. A Gift From Us.